Albion manufactures wheels to fit almost all needs; including antimicrobial, metal, pneumatic, semi-pneumatic, never-flat, nylon, phenolic, polypropylene, polyurethane and rubber tread wheels. ﻿Click here to download the complete Muvtons Wheels PDF. • Low rolling resistance; Smooth and Noiseless running. • Non-Marking and floor protective. • 100% tested and guaranteed against Bond Failures. • Polyurethane 93 ± 3 Shore A mechanically and chemically bonded to precision machined cores. that holds the precision bearings and provides structural rigidity. 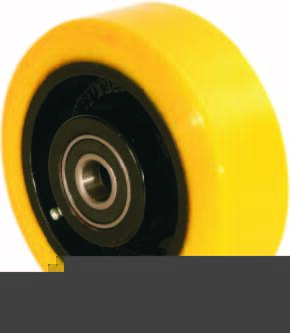 • Can be used for corrosive applications with suitable bearings. • Liquid Cast Polyurethane 93 ± 3 Shore A firmly bonded to precision machined Cast Iron Cores. • Elastic Rubber tired wheels chemically bonded to precision machined Cast Iron Cores. • Highly resilient 75 ± 5 Shore A rubber. • Smooth and silent running in power towing applications. • Suitable for medium duty hand truck applications. • Fully machined tread faces – crown treaded for easy maneuverability. • Can be used up to 800 o F with appropriate wheel bearings. • Suitable for extra heavy loads towed in punishing conditions. Acorn™ has been the leading U.S. manufacturer in the production of cast polyamides for any standard or custom caster and wheel application.